The Hobby-Eberly Telescope sits atop a mound in west Texas. McDonald Observatory is located in one of the darkest places in the country at night. Most of America experiences a great deal of light pollution from the artificial lights of cities. 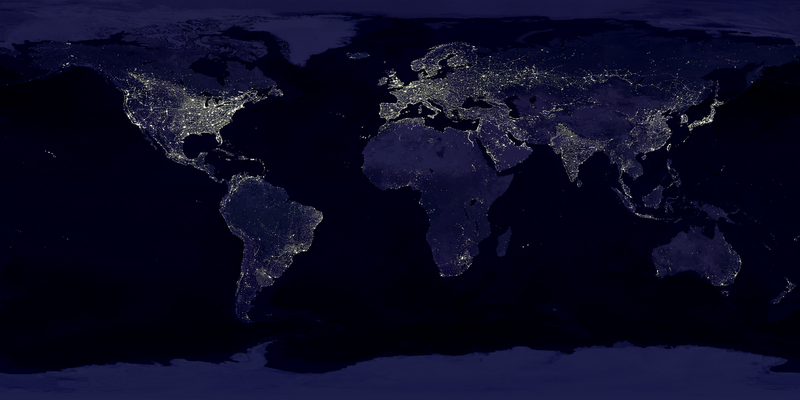 Take a look at this image (public domain) of the intensity of light coming from the world at night. Big Bend is isolated enought that you might actually get to see the stars! Certain stars, such as those that form the big dipper, can be seen even in places like New York or Los Angeles. But the stars that can be seen in cities are only a small fraction of the stars that are out there. If you have never looked at the night sky outside of a city, it is something to behold! This image, zoomed into McDonald Observatory and Big Bend National Park is cropped from David Lorenz's Light Pollution Atlas 2006. Here is the full image of North America from which it was cropped. You can see that this part of Texas is one of the few areas in the U.S. that are the darkest.